We left Tacoma Washington for Auckland NZ on Saturday the 7th, arriving 18 hours later at 6:30am NZ time on the 9th (A day? We lose a day? Where does it go? It’s gotta be lurking somewhere). It’s a little weird to be writing this in sunshine on Sunday and knowing that it’s still daylight there in Cincinnati, only it’s Saturday. So it sounds like I could buy the Wall Street Journal here on Tuesday and make a killing in the stock market there on Monday. No? As soon as we arrived in Auckland we left the airport for the wharf and took a ferry directly to Waiheke Island. We’ll recover here for a few days (did I say they have some very good wineries here? Like >20? Waiheke is quite an attractive place – in spite of having their warmest winter ever, and no rain for like 5 months, the place is green, green, green. And green with different flora than we’re used to seeing. Lots of flowering stuff. The pictures below are from the beach that’s at the base of the hill where we’re staying. Nice! 2nd day in paradise. After sleeping for 12 hours we walked to 2 wineries a few miles away, up and down hills along a coast before turning inland. Living on a coast certainly has an allure; there’s the rhythm of tides and breakers, a tranquility, dogs and owners walking on the sea strand, dog chasing the gulls … nice. The many wineries on this island are apparently all boutique. They sell everything they produce, and prices are high – they start at $30. One of the two wineries was amazing – MudBrick Winery. They own 15 acres and produce something like 15 wines, for a grand total of 4,000 cases. We tasted 10 wines, bottle cost $30 – $50, and they are worth every penny. Yummy! I’m really going to like NZ! I asked if they export at all, and they said yes – they send 40 cases to Auckland (35 minutes away). Below is a picture of their vines, protected from the wind by those hedges at the top of the hill. Wind here can be fierce. We also got an interesting tutorial in our wine tasting; the hills produce quite different microclimates, and the wines from the same grapes just a km away were quite different. Speaking of prices, we are shocked at the high cost of living here. Auckland, NZ’s largest city, is known to be expensive, and here on the island everything has to be ferried over, but still! A decent simple house is $500,000, with a view $750,000, and an actually nice house is well over 1 mil. Asparagus is $1 a stalk. Pasta is $14 a box. Bananas are $2.25 a lb. Everything is at least twice the cost in the US. Lunch for 1 (crab omelet, coffee) is $25. We quickly decided to do dinners here in our room (seems like most hotel/rooms come with an efficiency kitchen). We’re hoping things settle down once we leave the Auckland area! The birds we see are typically large and interesting, with very beautiful calls. I’ll be showing you pictures of birds – NZ has unusual ones; the islands originally had no mammal predators like rats or possums or foxes, so birds evolved to fill the niches that mammals usually inhabit. That gave rise to, for instance, the flightless kiwi bird that feeds at night …. The birds took a beating when mammals were introduced (Kiwis [the people] hate possums), but predator-eradication programs have created sanctuaries on islands and other regions where these birds now do well. There are two birds below: we don’t know their names yet. I almost forgot to mention what I think is a somewhat wacky sense of humor in the official NZ world. 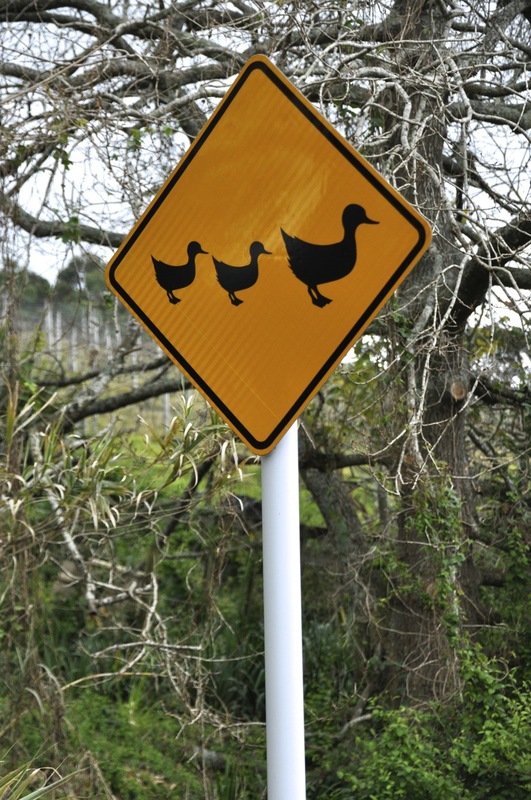 For instance the duck crossing sign? Also an official sign for parking at the wharf, that says “Parking”, next line “48 Hours”, next line “2880 Minutes”. All for now, more adventure tomorrow. This entry was posted in New Zealand, North Island, Waiheke Island. Blog seems better than you apparently think it is! Keep it up! By the way, the two birds you posted are an Australian magpie and a Pukeko. I’m intrigued by the different bird species there. Maybe chase some more birds around with your camera? ?